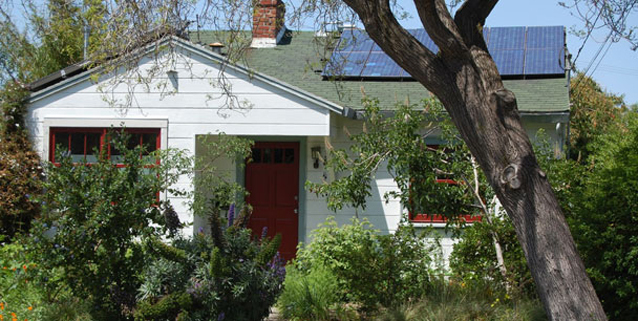 EcoHouse is a demonstration home and garden located in a North Berkeley residential neighborhood. Classes, workshops, and tours of the house and garden are designed to teach people from all walks of life how to make their living spaces healthier, more productive, energy and water efficient, and ecologically friendly. EcoHouse demonstrates ecological ways of living that are accessible and affordable to people of all ages, ethnic/racial backgrounds, and income levels. EcoHouse is a private residence and only open to the public during scheduled workshops and tours. To find out about upcoming events at the EcoHouse, visit our online EcoCalendar, or subscribe to our EcoCalendar email updates. For further information about EcoHouse, contact the Ecology Center by calling 510-548-2220 x239 or emailing minna@ecologycenter.org. Ecohouse has solar panels, an on-demand water heater, water-saving fixtures, natural and recycled building materials, natural linoleum floors, salvaged kitchen cabinets, bamboo kitchen countertops, a greywater and wetland system, a rainwater catchment system, a strawbale and rammed earth shed, a living roof, an organic permaculture garden, native drought tolerant plants, mushrooms, and more. Read about the many demonstrated features on the EcoHouse Features page. October, 2007, the Berkeley EcoHouse’s constructed wetland and greywater hybrid design became the first to pass code in the state of California, and became the first permitted, residential greywater system approved by the City of Berkeley. Access greywater plans, fact sheets, and resources on our Greywater Resource page. Property Assessed Clean Energy (PACE) programs provide commercial and residential property owners with financial assistance for energy efficiency, water conservation and seismic retrofit projects. Unlike other financing options, loans provided via PACE are based on property, rather than credit. Payments are only made once all work is complete. Payment is divided into annual increments and added to your property taxes. Several PACE programs are available to Bay Area residents. Visit the City of Berkeley’s Office of Energy & Sustainable Development for more information and a list of companies that serve the local Bay Area community and beyond. EcoHouse was founded in April 1999 by a group of talented and inspired individuals with a common passion for restoring ecological systems and building healthy, stable communities. In 2006, EcoHouse became a program of the Ecology Center, and a popular demonstration site for the Ecology Center’s many classes and workshops on sustainable living techniques. Read about how EcoHouse came to be on our EcoHouse History page. EcoHouse is a rental property as well as an active demonstration project. The tenancy is atypical in several key ways: The Ecology Center hosts workshops, classes, tours, demonstrations, and media events onsite. Occasionally, tour groups are led through the EcoHouse kitchen and living room. Demonstration projects are initiated and executed in the house and yard. Currently, we are not taking applications for tenancy.